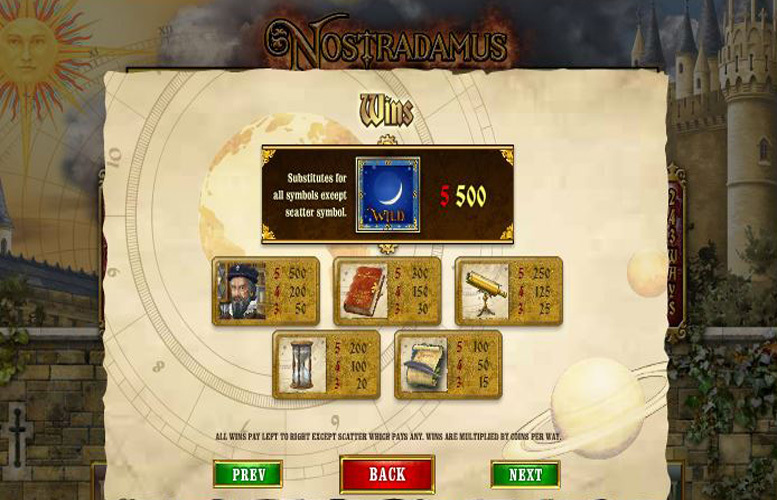 The Nostradamus slot from Playtech is a feature-packed game that offers players plenty of opportunity to win big with its great bonus rounds. The slot starts with an amusingly out of context video about our hero’s famous predictions for the future, backed with what sounds kind of like heavy metal. It’s all a bit odd, particularly when, as the slot itself starts, we’ve clearly a game that’s more medieval than it is Megadeth. The art work, music, and all other aspects of the game from this point is all more what we’d expect from a game themed around a prophet from the dark ages. That strangeness out of the way, the slot itself is great. It’s a five reel, three row machine with the 243 ways to pay system used for pay outs. That means that any three or more adjacent symbols of the same kind will receive payment. “Wild” moon, or Nostradamus = 500x the coin value. Book = 300x the coin value. Telescope = 250x the coin value. Hourglass = 200x the coin value. Quill and parchment = 100x the coin value. 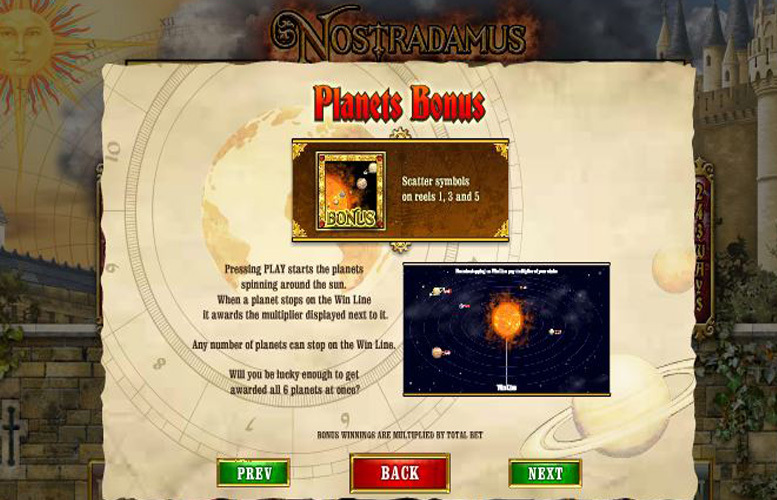 One of the Nostradamus slot’s strongest areas is certainly its features. The game is loaded with bonuses, and this makes enjoying the experience again and again easy. Occasionally during the game Nostradamus appears and scrawls a bonus on the roll presented to the player. This happens entirely at random. He can award multipliers for the current spin, a reel modifier feature (see below), or just a straight up big win. Landing the line of planets “scatter” symbols anywhere on reels one, three, and five simultaneously will trigger the Planets Bonus. Players are taken to a different screen where there are planets orbiting the sun. When a planet stops directly on a win line, it awards the multiplier displayed next to it. Any number of planets can stop on a win line too. It’s even possible to hit all six at once for a huge bonus. All multipliers are applied to the value of a coin at the time the bonus triggered. The free spins scatter symbol is represented by a globe. Landing three or more triggers a certain number of free games, with a different bonus reel modifier. Three scatters = five free spins, and any one reel-modifier can be activated. Four scatters = 10 free spins, and any two reel-modifiers can be activated. Five scatters = 15 free spins, and all three reel-modifiers are active. There are three modifiers for the free spins: earthquake, lighting, and tsunami. They each have special bonus qualities. When the earthquake modifier is active, after every spin aftershocks cause random reel symbols to fall away, with enhanced symbols replacing them. With the power of the lighting active, following every spin a bolt of energy strikes the reels and transforms up to four symbols into wilds. The final power up for free spins is from the sea. Players who activate the mighty tsunami are rewarded with random reels transforming into stacked wilds. Ace = 70x the coin value. King = 50x the coin value. Queen = 40x the coin value. Jack = 30x the coin value. 10 = 25x the coin value. 9 = 20x the coin value. One area that does let the Nostradmus slot machine down is its lack of variables when choosing a bet size. This limits the control the player has over where their money goes. The only aspect of bet sizing that can be adjusted is the coin value itself. The minimum is 1p, and using the 243 ways to play system, that makes the minimum total bet 25p. By contrast, with the maximum coin value set (£5), the total bet is more substantial £125. 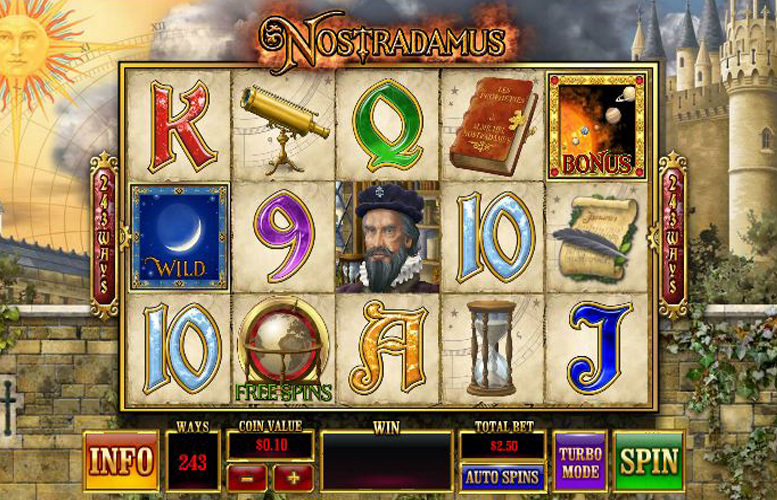 The Nostradamus slot is a great game to enjoy on multiple occasions. There are a lot of features to activate, and the different modifiers on the bonus stages make for many combinations to try out. It might not be ideal for the highest rollers, with its just over £100 maximum spin but for most players this is more than enough. All told, the slot looks, plays, and feels fantastic. This game has a rating of 5 / 5 with 487 total reviews by the users.